Do you want to learn more about how to build your website and make it look better for more traffic? Then one of the things you should prioritize is your SEO. After all, with millions of people using search engines each day, you want to make sure that some of these Internet users click your link based on what they were searching for (without having to pay Google!). Fortunately, there are companies like Joel House, as well as tools that can help monitor and improve your search engine rankings. But what are the tools worth using? Read on as I show you the seven SEO tools to help you gain organic traffic. This is one of the top tools a lot of professionals and website owners use today. This is a complete tool with everything you need, helping you with any issue and recommending what you can do for your website to make it rank higher. It can spy on all your competitors, from the traffic, keywords used, backlinks, even their popular articles. Besides that, the tool also performs complete site audits and comprehensive keyword researches. That way, you know what you should work on in the technicalities of your website while also getting fresher content ideas which help make your website searchable. One is able to use SEMrush to monitor posts from your website and what’s shared on social media. This is especially important so you’re able to know what’s trending and what makes such posts shareable, outranking all your competitors! Influencer marketing is now becoming one of the top marketing campaigns many businesses use today. To quicken the process of searching for influencers, Ninja Outreach is there to help you out. It has an extensive database of all available influencers, helping you find the top ones based n your niche. You’re also able to automate reaching out to such chosen influencers, which makes the campaigning process efficient and quicker. The tool automates emails with as much personalization as it can, getting backlinks and positive responses as quickly as you can. Not only do you get backlinks, but there’s a chance to work with influencers to connect with their target audience, having more potential customers interested in your niche. To complete your content and make it seen by search engines, rich snippets are the way to go. These are the texts you would find on search engines, which make or break the chance of people getting interested in it and clicking your website. These snippets give an idea of what the content is all about, and if it isn’t good, then goodbye! WP Rich Snippets offers the features that have you add required schema markup language, making all rich snippets ready and readable. These don’t directly help with SEO, but help increase organic traffic and more interested viewers. 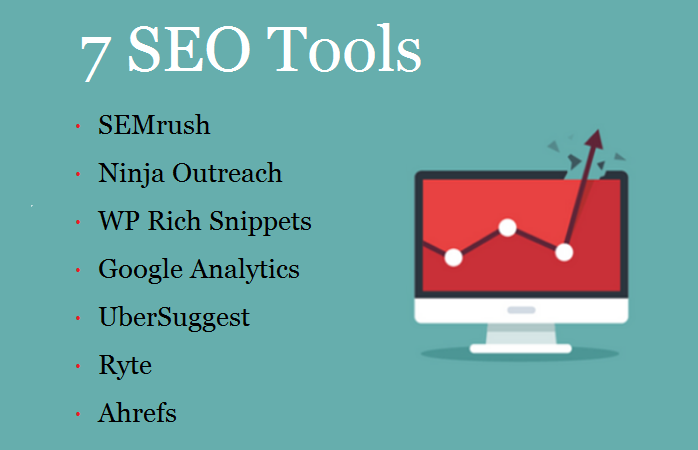 Some of the top SEO tools list always includes tools from Google, with Google Analytics being one of the most useful ones out there. Google provides comprehensive Analytical Reports, which tracks all your high-ranking keywords, as well as your page values and traffic. Through knowing which of your pages are most popular, you’ll be able to monitor and learn about what has your viewers come back and what they want to read. What’s great about this tool is that it’s totally free and easy to setup, as all you need is a Gmail account. UberSuggest is a free keyword research tool which helps you find the high PPC and the less competitive keywords to heighten your ranking. It recommends long-tail keywords, showing you search volumes of your wanted topic and correlated keywords. They also offer more suggestions on what kind of keywords to use, which gives you an idea on content topics while aiming for higher ranks on search engines. UbersSuggest even shows the highest ranking website of that particular keyword, so you can spy and make your content even better. The plus side of this tool isn’t just its free use, but the easy navigation. Ryte is best known for crawling through your site, looking into any technical problems and what needs to be improved. It’s connected with the Google Search console, offering the daily, weekly, or monthly website analysis to look into any SEO errors on the website. Ryte shows any problems from your server or if there are crawling problems search engine bots may come across. And what makes this tool good to use is that you can check out your competitor’s website to see if they have any errors as well, so you can top them before they notice! Ahrefs is another comprehensive and complete tool that audits your entire website. In just a few hours, you’re able to get an entire report on what you need to improve on when it comes to SEO. The tool comes with a ton of features, from a health rating for your website as well as teaching you how internal and external links work. Other than audit checks, it’s the only tool that provides other features like a keyword, content, and even site explorer. And there you have it! With the right kinds of tools to improve your search engine ranking, you’ll be able to attract more visitors AND gain organic traffic for better conversion rates. Plus, you get more audience and potential customers for your business, making it worth the effort. Hopefully, these seven SEO tools to help you gain organic traffic will help you out. So don’t wait any longer and look into any of these tools today or contact Joel house for help! If you have any questions or want to share your tips and experiences on these SEO tools, then comment down below. Your thoughts are much appreciated! Joel house is founder of Joel House Search media. It is well established brisbane company. Joel House has worked on digital marketing from past few years. He has team of experts which provide advice for your business. He also ensures that clients gets the best ROI and the best SEO available anywhere on the market. This is just amazing to know a lot of information.. The article is amazing and i also write bloags on Latest Movies download if you are intrested then do visit us.